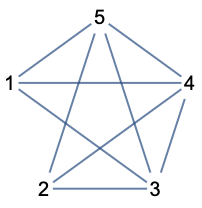 makes a graph by deleting the edge e from the graph g.
deletes a collection of edges from g.
deletes all edges that match the pattern patt. EdgeDelete[g,e] will delete the edge e only if it is present in g.
An undirected edge can be specified using vw or UndirectedEdge[v,w]. A directed edge can be specified using vw or DirectedEdge[v,w].